Learn Secret Online Branding Techniques to Help You Stand Out! Branding is the process of identifying you, your product, or your service and making it stand out from the competition. But a brand is more than an identity; effective branding can help you establish an emotional connection with your target market. 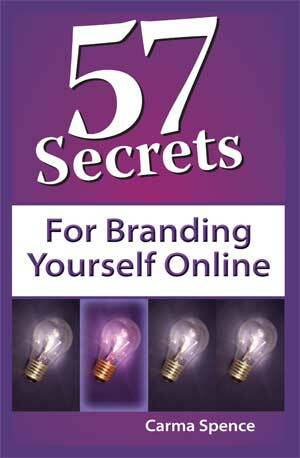 In this book, learn how you can use the power of the Internet to brand yourself online. Get practical advice and creative ideas that will help you and your business stand out online. NOTE: The book is also available from many other online booksellers; just do a search on your favorite site using the ISBN below. Carma Spence is a multi-dimensional entrepreneur, science-fiction writer, and poet with more than 20 years of experience in marketing, public relations, and science communication. You can read more about Carma on her 57 Secrets author page or visit her Web site: www.CarmaSpence.com.